The proper evaluation can make all the difference! 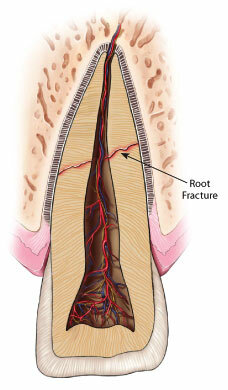 Root Fractures: A traumatic injury to the tooth may also result in a vertical or horizontal root fracture. The direction and also location of the fracture determine the long-term outlook of the tooth. If a horizontal fracture is close to the root tip, the chances for success are much better. However, the closer the fracture is to the vicinity of the gum line and the more vertical it is, the poorer the long-term success rate. Sometimes, stabilization with a splint is required for a period of time. Chipped primary (baby) teeth can be restored quite esthetically. Dislodged primary teeth can, in rare cases, be repositioned. However, primary teeth that have been knocked out typically should not be replanted. This is because the replantation of a knocked-out primary tooth may cause further and permanent damage to the underlying permanent tooth that is growing inside the bone. Children's and adolescents' permanent teeth that are not fully developed at the time of the injury need special attention and careful follow up, but not all of them will need root canal treatment. In an immature permanent tooth, the blood supply to the tooth and the presence of stem cells in the region may enable your dentist, pediatric dentist or endodontist to stimulate continued root growth. Will the tooth need any additional care or treatment? The nature of the injury, the length of time from injury to treatment, how your tooth was cared for after the injury and your body's response — all affect the long-term health of the tooth. Timely treatment is particularly important with dislodged or knocked-out teeth in order to prevent root resorption. Resorption, an eating away of the root over time, occurs when your body, through its own defense mechanisms, begins to reject your own tooth in response to the traumatic injury. Following the injury, you should return to your dentist, pediatric dentist or endodontist to have the tooth examined and/or treated at regular intervals for up to five years to ensure that root resorption is not occurring and that surrounding tissues continue to heal. 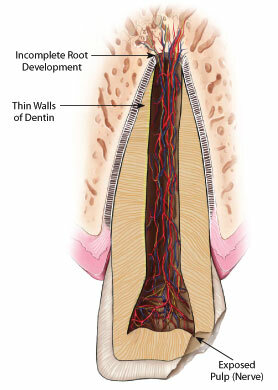 It has to be noted that some types of resorption are untreatable.